The International School of Peace (ISOP) in Lesbos, Greece. Photo: ISOP. A Jerusalem-based research center that has critiqued intolerance toward Jews in Arab textbooks said on Monday that it will help develop a curriculum for young asylum-seekers on the Greek island of Lesbos. The Institute for Monitoring Peace and Cultural Tolerance in School Education (IMPACT-se) will partner with the International School of Peace (ISOP) as it teaches some 400 students — ages 5 to 16 — subjects including English, math, and language skills in their mother tongue, whether Arabic, Persian, or French. The school is run by members of Israel’s socialist-Zionist youth movement Hashomer Hatzair, in partnership with its Israeli-Arab sister group, Ajyal. Staff members hail from Israel, Syria, Iran, and Afghanistan, and some are asylum-seekers themselves. The study found that asylum-seekers on the island — the majority of whom live in its largest camp, Moria — face the risk of violence and arbitrary detention, limited health resources, subpar living conditions, and insufficient access to food and water. Nearly 35% of minors who participated in the study said they did not have access to any form of education. 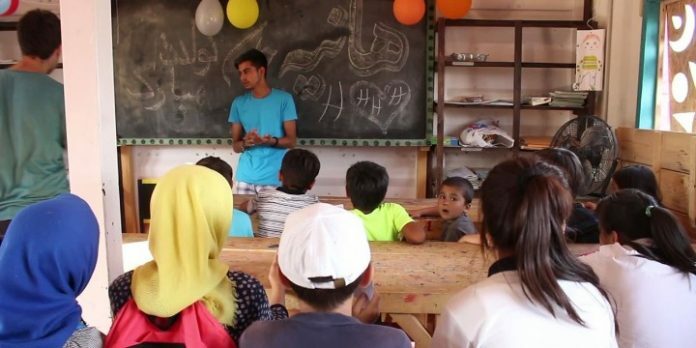 “Many of these young refugees lost years of formal education during the Syrian civil war and in other conflicts and have not been integrated into the Greek educational system,” IMPACT-se said. “It perpetuates an environment of intolerance and a stress on radical martial heroism conjoined with pan-Arab nationalistic ambitions,” wherein “Jews and Israel are demonized,” it added.